These two maps illustrate the Kansas village site, 14P024, commonly referred to as the Blue Earth Village, east of Manhattan, Kansas between the Kansas and Blue Rivers. 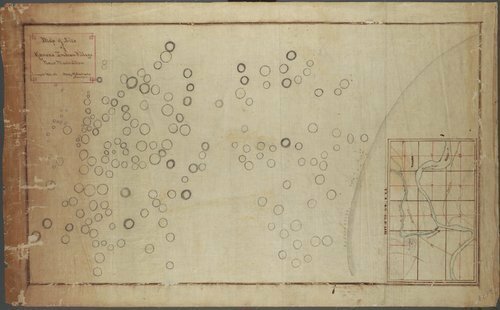 The large circles depict houses while the small circles could possibly be cache pits for food storage. The small squares along the Kansas River may represent burials.